What’s wrong with my plants? Trying to figure that out can be challenging. Here are a few common problems you might run into and be able to correct. 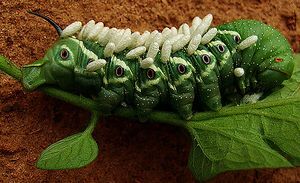 The Tobacco Horn Worm (above) and Tomato Horn Worm (below) are fairly common. They are often mistaken for each other and both love to munch on tomato plants. Most often you will not see him until you see the damage he has done to some of the leaves on your plant. Once you see the damage, go on the hunt. As awful as it may seem, look for his poop – he will be on the leaves directly above. Remove him and feed him to the birds or frogs (a favorite of both). If he has these white Q-tip looking cocoons hanging off his body, he’s no longer a threat to your plant. Those are the cocoons of a tiny Braconid wasp (a good guy), and this caterpillar is now the host food for those immature wasps. If you allow the wasps to finish their life cycle, they will help control any future horn worms in your garden and they don’t sting people. Click HERE to help recognize the difference between diseases and an environmental issues. All these possible problems may lead gardeners to believe that growing tomatoes is more work than it’s worth. Not so! Most often plants survive and still produce fruit even if they become diseased, over watered or are eaten by bugs. The best way to have a truly successful tomato harvest is to prevent problems before they start. Prepare your soil well, keep your plants healthy with proper feeding, consistent moisture, and good air circulation. And a great preventative is to apply a foliage spray of kelp every month.